Give gravity a hand. Help your next shot easily clear the net, dive downward faster, or bounce low by applying topspin or backspin. When you hit a tennis ball, gravity will naturally pull it to the ground. To hit a winning tennis shot you will want to confuse your opponent and make the ball drop quicker than expected, or bounce low and slow on the court. To do this you need to change the way the ball moves through air molecules; angle your racket head as you brush up over the ball and make it spin. When the surface of a spinning ball, especially a fuzzy ball, comes in contact with air, friction is created between the air and the surface of the ball. 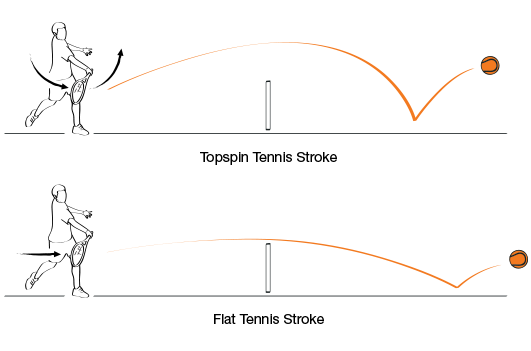 Friction creates unequal air pressure around the ball, changing its trajectory. Adding topspin to a ball forces the ball’s path down while adding backspin forces the ball up.